Few societies have so vaunted a tradition of leading crusades as Taldor, yet the constant revisions to its history by scheming factions leaves the truth obscured by countless acts of political modifications. Even the lauded Kitharodian Academy’s texts are riddled with these changes, so when a secretive ally approaches the Pathfinder Society with information about a hidden archive that contains the unaltered histories, the Pathfinders plan a daring infiltration to recover the secrets of Taldor’s past victories so that Mendev might benefit from the discovery. 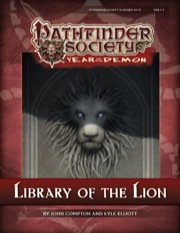 Content in “Library of the Lion” also contributes directly to the ongoing storylines of the Cheliax, Grand Lodge, and Taldor factions. I have a Barbarian 1 or Alchemist 3 to bring to this depending on sub-tier. I have a level 1 wizard I can bring for subtier 1-2. If we play in the upper subtier I can play a pregen. This FG Con even will be the first time I’ve played Pathfinder. I’m planning to create a new level 1 rogue for FG Con but I’m flexible. If a different class or subtier is selected, I’m happy to play a pregen. Be sure you take a look at the PFS rules when creating your character. I’ll be sending out more information once we get all our players together. This would also be my first PFS game. Ideally I’d want to roll up a 1st or 2nd level character of my own. Based on what I’m seeing other people’s characters may be, perhaps a Cleric or Oracle. I’ve read the rules. For PFS.. all characters start at level 1. Have you downloaded the Pathfinder Society Roleplaying Guild Guide? It has all the specific rules for PFS play. I am happy to help with questions regarding character building between now and the event. Yea I’ve read through most of it – 20 point buy, a few minor alterations to some classes, max hit points at first level and just above half for the rest, no evil characters, etc. The main thing that I have felt confused about really is the allusion to the tier system, I couldn’t find any reference for exactly what is meant by the tier system, wether it just refers to character level or something more specific. Surely it’s not the same thing as a tier system as it’s normally used, I.E. an informal rating system for the classes. The Tiers and Subtiers relate to which characters can play which scenarios. This game is a Tier 1-5 with Subtiers 1-2 and 4-5.. this basically breaks down to we either play in the lower tier with the game geared for that group.. or the higher if that is how it works out. The subtiers are decided based on who shows up at the table. If we have a lot of lower level guys.. we’ll end up playing Subtier 1-2. (that looks like the way this one will go) A Level 3 character can play in either subtier. If your character is outside the Tier.. it cannot play that particular scenario. So a level 6 or higher character cannot play this game. Thanks for clarifying. It would be most fitting for a first play through to be in the 1-2 tier with a 1st level character. It looks like that’s exactly the direction this is going anyway. If a 1st level Cleric of Desna is fine with you I think I’m going to go that route. Apologies. My wife has decided to plan an out of town trip for us that coincides with the FG Con weekend. As a result, I’ll have to withdraw from the entire weekend’s activities. Just as a I finished creating my rogue, inputted it into FG, and figured out how to export it from FG as well. Bummer…guess I’ll save the rogue for next time! Hope everyone has a good time! Looks like we are at the lower end – which is good, Tellinale (Magus 1) would like to get some more field experience. I will have a cleric who should have just become level 2. My wizard will hopefully be level two by this session, assuming he survives the weekend. Hahahaha! Hi – I am new to Pathfinder but have played 5e before in person. I was thinking of starting with a straightforward class, perhaps a Fighter, but am happy to play anything and/or use a pregen. Squeak.. you are welcome to join us.. but you need to book a space in the game. There is one left at the moment so grab it while you can. I have just placed an application. As I said I was thinking of going Fighter (possibly with a multi-class into Cleric later) but am happy to play and class or even a pregen. Sadly it looks as if I may be busy next Sunday. Consequently it is probably best for me to withdraw now so that someone else who can definitely come can have a place. Thanks for everything and I hope you all have a great time! once, again, this is the last time i will bother ya’ll as I mention that I am booked for all the rest of tier 1-5 games throughout this weekend; and, I am still hoping to get into this game here if there are any drops or anything – I see that a couple people have had to drop already, unfortunately. If I was asked to join this game, even late . . . the following was a bit I have posted on all other games I have already been booked for so far. I was asked to share info about the character I will be bringing to game during FG Con, so . . .
(And then) Other than that, I don’t know what to share except for the fact that I am a complete and utter newb to Pathfinder and Fantasy Grounds and I will be glad to receive any/all helps that I can get before/during/after game. Thanks :). See ya’ll at the Con :)! AGAIN! Sorry for all caps. However . . . IF THERE ARE ANY DROPS/ETC AND YA’LL WOULD EXCEPT ME INTO THIS GAME, EVEN LATE, please do let me know?! Have fun, ya’ll! Game On! I just had to pull out due to work commitments so go ahead and grab that spot. If you have not received an email from me regarding character info, check your spam folder. I still have not received info from Brainpolice. mmoplayer79, if you want the empty slot grab it quick before someone else takes it. sorry that you had to work and can’t play this game, dpoet. i know that i’d rather be playing then working anyday ;P. lol. but, for what it’s worth, thanks for the spot 🙂 hope all goes well for you.